The Former Carroll County Courthouse-burned in 1931 but all records were saved. The first settlements in Carroll County were made at McLemoresville and Buena Vista about the year 1820. The first settlers in the vicinity of Huntingdon were Samuel Ingram, John Crockett, James H. Gee, Wm. A. Thompson, Thomas Ross, John Gwin, Robert Murray and others. As the organization of the county took place almost immediately after the first settlements were made, every person hereinafter named in connection with the organization of the county and courts were early settlers. Large tracts of the most valuable lands of the county were entered by the location of North Carolina military land warrants, and owned by non‐residents. Mimucan Hunt & Co. held such warrants for twenty tracts of land, each containing 5,000 acres. These lands were all located west of the Tennessee River and largely in Carroll County. The Indians left the county about the time the settlers appeared. But the unbroken forest was then infested with bears, wolves, panthers, deer, wildcats, the smaller wild animals, and snakes. It is said that the reputation this country then had in North Carolina, was “fifty bushels of frogs to the acre, and snakes enough to fence the land.” The wild animals destroyed many of the domestic animals of the early settlers, but they were hunted and subdued until all of the more destructive ones have become extinct. The first bridge built in the county was McKee’s bridge on the Big Sandy. In 1822, and prior thereto, there were no mills in the county, and the first settlers had to go to Humphreys County to get their milling done, and family supplies, such as salt, coffee, etc, were then brought from Reynoldsburg on the Tennessee River. The first gristmill in West Tennessee, was built in Carroll County by Isaac Blount on Blount Creek, on the site of the mill since owned by Joshua Butler. In March, 1824, Wm. Harris and Reddick Hillsman obtained leave of the county court to build a mill on Reedy Creek, and John Stockard was granted leave to build one on the same creek. Prior to this the same privilege had been granted to one Green, on Hollow Rock Creek. About the same time R. E. C. Dougherty built a mill on Clear Creek. James Shields erected the first cotton‐gin in the county, on a place near Buena Vista. The first will probated in the county was that of David Clark, deceased, probated in June, 1824. Andrew Neely was the first infant ward and John S. Neely the first guardian. Wm. Roberts, called Bit Nose Bill, was the first man married in the county. About 1831 the Huntingdon turnpike leading to Jackson was constructed. The raising of cotton was begun by the early settlers. Tobacco was raised in the northern part of the county. The people are industrious and generous, primitive in their habits, and manufacture and wore a great deal of home‐made clothing. Agricultural products of the county included Indian corn, oats, wheat, hay, cotton, Irish potatoes, sweet potatoes, and tobacco. Live stock included horses and mules, cattle, sheep, and hogs. The first courthouse, built in 1822, was a small log cabin, without a floor, erected where the present one now stands, and Nathan Nesbit, chairman of the court of pleas and quarter sessions, blazed his way through the forest from his residence, five miles east of Huntingdon, to the county seat, carrying with him his cross‐cut saw, with which he sawed the door out of the new court house, and entered therein and opened the first court held at Huntingdon, December 9, 1822. At this term the jurors of the court brought their provisions with them and camped out. The town of Huntingdon was surveyed and platted by James H. Gee, under the supervision of the commissioners appointed to lay out the town. At the December term, 1823, the name of the county seat, which up to that time had been called Huntsville, was changed to Huntingdon. They were anxious to retain the first syllable, and thereupon James H. Gee, who was a musician as well as a surveyor, and who was fond of the old tune Huntingdon, suggested that name and it was adopted. There were 117 lots and the public square in the original plat of the town. The first courthouse was sold in 1824 to John Crockett, who moved it away and used it for a kitchen. It was replaced that year by a frame house 20×24 feet. 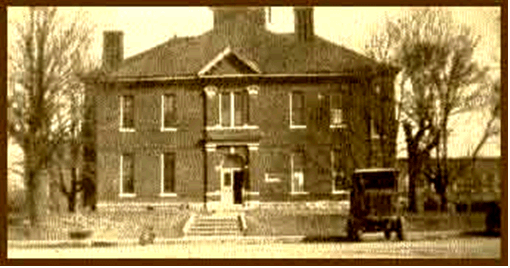 This stood until about 1830, when the third court house, 30×50 feet, was built of brick. The fourth courthouse was completed in 1844. The rock for the foundation was hauled from Benton County. The house cost about $12,000. It was a two story brick structure, with two offices and a court room on each floor. The second courthouse was sold to Robert Murray and moved to his lot east of the public square and used as a warehouse. The first jail was erected in 1824. It was a small hewed‐log cabin, from which the prisoners frequently escaped. The poor farm, consisting of 134 acres, was purchased in 1852 from Thomas Butler. The buildings were improved in 1877 and later, by removing the old log cabins and erecting in their stead neat frame cottages. The farm was enlarged in 1886 by the purchase from W. O. Davis of 104 acres of timber land adjoining it. The inmates of the poor asylum averaged about thirty in number, and appropriations are made by the county court for the support of about forty poor persons who reside with their friends throughout the county. The poor of Carroll County are well cared for. The Nashville, Chattanooga, & St., Louis Railroad was completed through the county soon after the close of the civil war. It has stations within the county at Hollow Rock, Huntingdon and McKenzie. The Memphis & Louisville Railroad was completed through the county in 1860. It has stations within the county at McKenzie, Trezevant and Atwood. At the second term of the court of pleas and quarter sessions, held in June, 1822, William Arnold, Robert Hughes, Will Stoddart, Archibald C. Hall and Thomas Taylor were admitted and sworn as attorneys to practice in said court. At the same time William Arnold produced his commission from the governor and was sworn as solicitor general of the Thirteenth Solicitorial District. At the next term of said court, September, 1822, John C. Bowen, John McBride, Peter Honnell, David Crockett, the famous hunter, and Hezekiah McVale appeared, and each made oath to the killing of a certain number of wolves, and were allowed the usual bounty for destroying those destructive animals. Carroll County, like many other counties in West Tennessee, was a divided county during the Civil War. Livestock farmers did not have slaves and were for remaining in the Union, cotton growers, etc. had slaves and wanted to secede from the Union. In their meeting at the Huntingdon Court House those wanting to remain in the Union left by the North door and the ones wanting secession left by the South door. Carroll County is not thought of as a place of much military importance during the Civil War, even though many brave men from this area fought and died in the conflict for both sides, not much mention of the events or terrible hardships that came to this part of Tennessee has ever been made. However, an event on the South Fork of the Obion River between McKenzie and Huntingdon showed what men had to endure for a cause they believed in. The over-night crossing of the flooded South Fork of the Obion River by General Nathan Bedford Forrest and his troops in December 28, 1862 is probably one of the most significant events that took place in Carroll County during this conflict. It is hard to believe that 2,000 men, with almost that many horses and mules, 12 pieces of artillery and 30 to 40 wagons, accomplished such a feat in such bad weather and in complete darkness. After crossing the Obion River, General Forrest fought the enemy on December 31st, at the famous Battle of Parker’s crossroads a few miles south of the Carroll county line in Henderson County, Tennessee. — Union telegram from Brig. General Jeremiah C. Sullivan to General Grant: Huntingdon, Tn. Dec. 29, 1862 8:06 p.m.